Importation and Legalization of Automobiles to the United States. This was written several years ago. Before there was a US Department of Homeland Security. CARB ( California Air Resources Board) if you are in California. It is a little difficult to transfer several years of knowledge and experience into a few lines of information. The truest way to learn the information is though doing it and from reading the Code of Federal Regulations , along with the local laws and information. 1)My state doesn't have emissions testing , so is it any cheaper to legalize my vehicle ? No , its not any cheaper as the vehicle , and every vehicle when first sold new must meet Federal Emissions Standards from the EPA . If your state does not have emissions standards , that does not mean you , or your state does not meet them . It merely means there is no in use testing. Federal emissions standards are FTP testing. It is run on a dyno from a cold start . Though an 11 mile drive cycle. All of the emissions from a vehicle are tested , and the vehicle must meet certain criteria for the year it was produced . Vehicles over 21 years old are EPA exempt. Local smog testing requirements for all 50 states. 2) I want to bring in a Toyota Supra from Japan ( or any vehicle not produced for the US market) , I have seen people have them here already , why do you say I can't have the car ? "All eligibility numbers are for left-hand drive motor vehicles except where right-hand drive (RHD) is identified after the model. While there is no specific restriction on importing a right-hand drive vehicle, an eligibility number based on a substantially similar U.S.- certified motor vehicle may not apply. Our experience has shown that the safety performance of right-hand drive vehicles is not necessarily the same as that of apparently similar left-hand drive vehicles offered for sale in this country. However, we will consider them "substantially similar" if the manufacturer advises us that the right-hand drive vehicle would perform the same as the certified left-hand drive vehicle in crash tests. If the vehicle is not substantially similar to one sold in the U.S., the RI would have to demonstrate that the vehicle, when modified, would comply with the applicable Federal motor vehicle safety standards, which could involve crash testing several vehicles. " from the DOT website. 3) What is FTP, or federal emissions testing ? Federal Test Procedure, or FTP means the test procedure as described in Sec. 86.130-00 (a) through (d) and (f) which is designed to measure urban driving tail pipe exhaust emissions and evaporative emissions over the Urban Dynamometer Driving Schedule as described in appendix I to this part. 4) What is the DOT ? 5) What is FMVSS ? 6) What is the EPA ? 7) What is CARB ? California Air Resources Board. The ARB is California's environmental protection agency. They are above and beyond the EPA in California. Read more about the ARB. 8) What does the customs service do ? 9)What is an HS-7, DOT import form ? It is the DOT form required to import a vehicle. 10) What is a 3520 -1, EPA import form ? 11) What is Show or Display exemption ? 12) I want to import a race car how do I do it ? 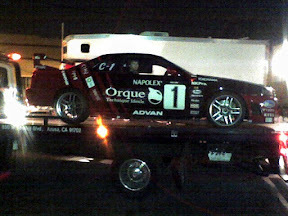 There are two ways to import a race car . 13) I want to do the work myself , why can't I ? Registered importers are supposed to perform all modifications as the modifications are covered by safety recall insurance . If the RI did not perform the modifications there is no way for them to ensure the modifications are done correctly. 14) Why do you care if I import a car and sell it ? If this guy sells it to someone , without the person fully knowing about the car they may have some problems . The only person that has something actually to lose is the guy that buys this car . If I can use some of my knowledge about this , to possibly help someone out , then I will . Does anyone remember the call I got from the guy with a Skyline in Canada . Someone had told him that he could import the car to Canada . Then drive it for a year before he had to legalize it . Have to tell him that there is really not much I could do for him . I gave him his options . He didn't think he was doing anything wrong . But hes the guy that gets screwed. Read about some seized vehicles here. 15) What do you know about the petition process for vehicles at the DOT ? You will see two 87 page documents from me for the LHD Mitsubishi Lancer Evolution VII and VIII . The first few pages are the actual work . The rest of the pages are substantiating documentation from Mitsubishi press releases , and service manuals.It took me about a month to do the Mitsubishi petition . Get the paperwork and information together . Do the research , etc . In February , 2003 I flew over to the DOT in Washington , DC and dropped off my petition . At first I bundled the VII and VIII together as they are on the same chassis CT9A . The DOT did not like this , and I had to go and split it into two petitions . It took about 2 months for them to decide they wanted to see it different . Then took several more months before they published the VIII petition in the Federal Register . Another month to publish the VII petition . Comments from Mitsubishi on the VII delayed the closing of the petition a week. There are comments from Mitsubishi on the VII petition also.The week after Mitsubishis comments I called the DOT to find out if they wanted me to formally comment on Mitsubishis comments , and they told me to stand by. Its been about 3 weeks now , and I am standing by. In all its been 11 months since I started the project .11 months. Sure in that time , everyone in the DOT has changed , some rules have changed . In the end, Mitsubishi kept making challenges, and we kept responding. Their final challenge that really took the sails out of the project was the claim that the side impact structure of the European car, and the US car were different. We were set to X-Ray the side of the car, but the money ran out, and the project was shelved. 16) I hear 1996 and up cars need OBD -II . What is OBD -II ? Do cars made for other countries have it ? 17) What about converting my car to run on propane, or other cleaner fuel ? 18) Kit cars. I want to take a car apart and import it as a kit car. Is this legal ? Motor vehicles" must comply with the Clean Air Act and may not be disassembled nor purchased in a disassembled form for the purposes of evading the Clean Air Act or the Imports regulations. In these situations the kit car body/chassis combination must be certified by the manufacturer, must be in a configuration which was previously certified by EPA subject to the guidelines discussed at "2" above or, in the case of an importation, an EPA form 3520-1 must be filed at the port of entry and the vehicle imported by an eligible ICI who must ensure that the kit car body/chassis complies with all applicable emission requirements. At the present time, there are no ICIs eligible to import kit cars. 19) I hear the military are allowed to import cars to the US? This is another untrue rumor spread by the internet. The military will move a members vehicle free of charge on a PCS (permanent change of station) move. HOWEVER, the vehicle has to be on the list of approved vehicles prior to the military allowing the move. Its always a friend, of a buddy, knew a guy, that did it. The military will not help you import your non-complying car.